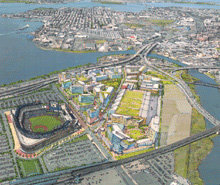 By Jeremy Smerd May 5, 2011 1:25 p.m.
Late Wednesday, the Bloomberg administration took a significant step toward the redevelopment of Willets Point, Queens. The state Department of Transportation and the Federal Highway Administration approved the Economic Development Corp.’s environmental assessment of off-ramps proposed for the Van Wyck Expressway. The city, which has called the ramps essential to the massive Queens project, can now go ahead with a required public review process. A handful of Willets Point property owners have been trying to halt the 61-acre redevelopment by arguing that the city reneged on a promise not to condemn any land until state and federal officials approved the two ramps. A court hearing next month on that question now appears moot. Once public comments are received, the city will resubmit its assessment for final state and federal approval. In the meantime, the city said it will move ahead with the first phase of the project, which does not rely on the ramps. Splitting the project into two phases allowed the city to move ahead without acquiring the holdouts’ private property or getting approval for the ramps, which had dragged on for many months. Posted in New York City Real Estate and tagged Bloomberg, EDC, Queens, Van Wyck, Willets Point on May 12, 2011 by NYLS BLOG.